We made it to England on the ferry out of Calais to Dover. 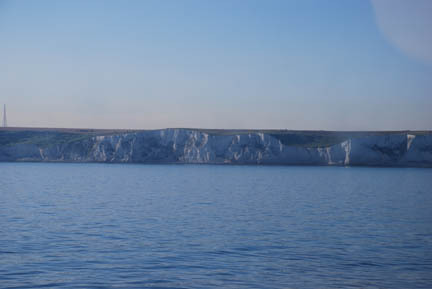 The famous "White Cliffs of Dover" are just that, huge chalk cliffs rising straight out of the sea. I had been thinking about taking the Channel Tunnel across (I want to take it at least one direction) but the day was so bright and sunny I decided to take the ferry and see the channel. Who knows what the weather will be like when we return. No, that picture is not backwards, we are really in England where they drive on the left side of the road. If you look at my windshield you will see the "Hey Dummy, Stay Left" reminder we put on the windshield (the black arrow made of electrical tape). 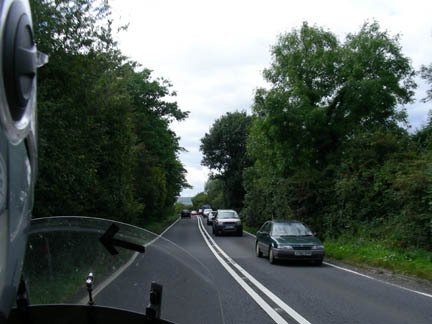 I have been driving for nearly 50 years and this is the first time oncoming traffic has gone by on my RIGHT side! The first couple of days it was nerve racking, then I began to get used to it. At the end of the first week I no longer flinched when they went by. Now nearing the end of the second week (as I type this) it is alright. Now is the time to worry. People get into the most problems when something is becoming familiar and the person no longer has it right in the front of their attention. The first place we went to was Pooh Corner where A. A. Milne wrote the books. Kathy went in and shopped while I researched out a campsite for that night. Neither of us took a picture of the place!!! 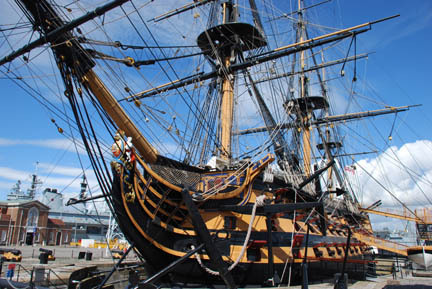 The next stop was in Portsmouth where we toured Admiral Nelson's final command, the HMS Victory. There were 820 men living on this ship when Admiral Nelson sailed it into battle against Spain in Trafalgar Bay (where the Admiral died). It was very crowded for the average seaman, although the Captain and the Admiral had lots of room. 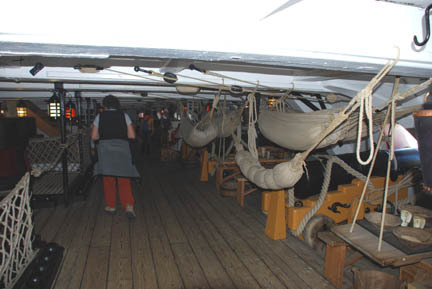 The sailors slept in hammocks slung side by side above and between the cannons. 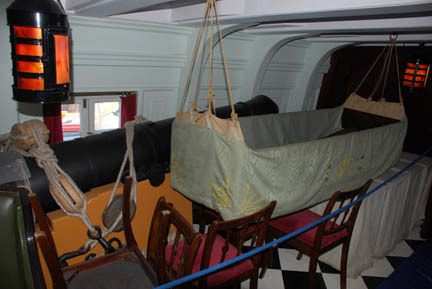 When they ate, they set up tables and benches between the cannons (look in the lower right corner of the picture). All of these were removed and stowed when the ship went into battle. The Admiral had life much better. 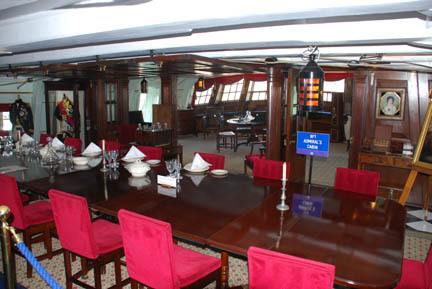 He had a huge cabin with dining area, for the ship's officers, and a separate sleeping area. But even here when they went into battle, it was cleared and cannon were moved in. From here we went on east and caught a ferry to Ireland. This was the ferry we rode. It is a high speed hydrofoil boat and does about 35 mph. The day we crossed the seas were "lumpy", to quote the staff on the boat. On the day we arrived at the dock this ship's evening crossing had been canceled because the seas were too rough for it and the staff didn't know if the it would be running on its crossing the next morning. There is also a bigger and slower ferry that was still running that afternoon but it was full. We bought tickets for tomorrow's afternoon crossing of the larger ferry. The next day we showed up at the dock in time to be on the faster ferry, if it was running. It was and we paid an extra fee and got on it. It was a very rough crossing. The boat pitched and yawed, bounced and swayed, and generally made life miserable for almost everyone on board. People were seasick all over the boat (there were bags available on all the tables and shelves). After a couple of miserable hours we arrived in Ireland and headed north to Dublin and a campground.